I have just returned from a concert tour of Lima, Peru and Quito, Ecuador, where our music was enthusiastically received. We were part of the third International Festival of Cajón Peruano sponsored by the Centro Cultural De España in Lima. We also had engagements in jazz clubs, schools, and in public parks. The United States Embassy in Peru also helped sponsor our tour and was very interested in the cross-pollination of our musical cultures. 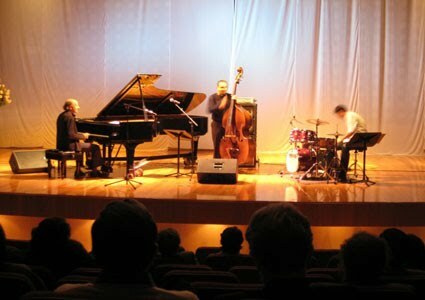 I went to Lima with my Peruvian colleagues, bassist Jorge Roeder, and drummer/percussionist Jorge Perez Albela. We also traveled with the amazing singer Sofia Rei Koutsovitis and with Eric Kurimski, a guitarist who has lived in Peru and studied the music there in depth. Peru has a very strong and deep tradition of rhythms and dances arising from its African/slave heritage – much like the United States where blues and jazz developed indigenously from a similar heritage. The Peruvian slaves, whose drums were confiscated by their owners, kept drumming, first on fruit crates, and then, as they evolved into what became their national instrument, a wooden box called the cajón. They developed rhythms and dances found nowhere else on the planet. Both US jazz, and Afro-Peruvian music starts with a four-beat measure and then divides each beat, into triplets. The North Americans feel the syncopated accents on the third triplet (right before the beat) – which gives jazz its familiar swing, while the Peruvians feel the up-beat on the second triplet. (right after the beat). This, in many ways, is a much more complicated rhythm which plays off of the ambiguity of hearing the music in “three” or in “four.” This is achieved by grouping the twelve sub-divisions in each measure (four triplets) as either six groups of two – or four groups of three. The four beat measure is also subdivided simultaneously into 16 subdivisions. All of which leads to an intuitive fluid and playful melding of three and four where feeling overrides math. But what was incredible – besides the phenomenal musicianship, enormous energy and devotion of the Peruvian musicians – was the way they so often heard and played their music in this 12/8 way of feeling the time. I would hear musicians play traditional Peruvian songs or Gershwin tunes or Beatles songs – all within this rich rhythmic framework. There is no end to the exuberance and virtuosity of the Peruvian musicians. I have always found that traveling in this way, in getting to hear, and meet, and play with musicians from other countries is of enormous value, in that it reminds me how important it is to put all of one’s heart into the music – every single time I sit down to play or practice. Afro-Peruvian music is gaining wider recognition and larger audiences worldwide. If you are interested in hearing some samples you can click the following links of some of my favorite artists. Why Should I Use a Music Agency for my Wedding Music? It is so easy in this day and age to find and secure musicians and disc jockeys directly through their websites. Why would anyone want to introduce an intermediary and book through a music agency? Will it not just add an additional expense the cost of the event? Clients often ask us these questions. Our response always addresses the quality, security and service booking through Music Management provides. Music Management Quality: We subject the artists on our roster to a strict screening policy for not only level of quality but also look, dependability and personality. They must play exceptionally well, but also understand that at an event they are part of a service team of vendors all working together to create a successful event. Music Management Security: In addition to being licensed and insured, when the client’s contract is with Music Management, it becomes our responsibility to insure that the artists perform at the event. Music Management Service: Our staff is available 24 hours a day 7 days a week either during regular office hours or via cell phone during evenings and weekends. We respond to inquiries and questions no later than 24 hours after they are received. In many cases it might actually be less expensive to use Music Management since we have more leverage to negotiate for a lower rate with our regular artists since we provide them with so much work throughout the year. There is a commission built into our fees, but in most cases it is the same rate that you would receive if you were to book directly through the artist. “Mili Bermejo remains one of the most, if not the absolutely most, emotive singers of Latin Jazz music currently recording,” wrote Cadence reviewer Alan Bargebuhr. Mili recently performed her latest project, a program of Love Songs of the Americas, at the Regattabar at the Charles Hotel in Cambridge. Her band consisted of pianist Tim Ray, bassist Dan Greenspan and cellist Eugene Friesen. Both Tim and Dan have been playing in Mili’s band for many years, but Mr. Friesen is a relative new-comer to the band. It is unusual to have the cello included in a jazz band and it added another warm and soulful voice that matched Mili’s voice beautifully. They began the program with a Brazilian tune, continued with tangos and bossa novas and even included a jazz standard or two. Mili’s voice is penetrating and gorgeous, full of deep emotion. Her music speaks to political situations in the Americas and of course, the songs she sang tonight spoke of love in all of it’s complicated dimensions. Since Mili sings mostly in Spanish, she tells the story of each song in English before she sings. One need not know Spanish to feel the emotional power of Mili’s music. She and her husband Dan Greenspan have been collecting and writing songs for the past 25 years. Music Management is proud to announce the addition of disc jockey, vocalist and radio personality Rich DiMare. Rich DiMare is a DJ at Boston’s hottest spots including The Roxy, Felt and Whiskey Park. In addition to the club circuit, Rich performs for weddings, corporate events, graduation parties and holiday parties. Rich can be heard on the radio with KISS-108’s popular Matty in the Morning show and is the producer of the Top 30 Countdown with Billy Costa. Rich is the perfect choice for any party occasion! “Rat Pack” with youthful energy and style. Philibin said, “Man, this kid sounds good”! The K2 band will host one of their highly successful band showcases again this month. This is a great opportunity to see the band live in action and ask any questions you may have directly to the band. Please let us know if you are interested in attending and we will be happy to make arrangements. For more information and video for K2, click here. Many brides dream of having a romantic outdoor wedding. While outdoor gardens, views of the water and beautiful sunsets do create a very special ambience, the surroundings are not always hospitable to musicians’ delicate instruments. The sun can be damaging to a stringed instrument’s fine finish, for example, or the ground conditions can put a harp in jeopardy. The wind can be a potential problem for music stands and the sounds of the ocean can hamper the sound of the music. There can be no rain, mist or drizzle. Musicians cannot perform in temperatures lower than 60 degrees. Musicians must be out for direct sunlight. Harps must be placed on a dry, level surface that is clear of debris. When close to the ocean, a tent for the musicians is desirable. If you have any questions, you can always call our office at 617-489-7600 and speak to one of our knowledgeable salespeople. We always try to accommodate your wishes. Music Management is pleased to present the Gilded Harps at the Boston Harbor Hotel this holiday season. Harp music will be played on Fridays, Saturdays and Sundays in December through the 20th from 2:30 to 4:30 p.m. in the Rowes Wharf Grill. You can learn more about the Gilded Harps here. For all you future brides and grooms planning your weddings for 2010, or for those of you still planning a holiday party, we’d like to give you a chance to hear some of our favorite bands live. If you are interested in attending any of the following events or showcases, please email us at [email protected] or call us at 617-489-7600 to RSVP and we will give you all the details. Music Management is proud to be participating in this year’s T.V. Diner Platinum Plate Gala with host Billy Costa of Kiss 108. The event takes place Saturday November 21st at the Herb Chambers Lexus Dealership in Sharon. Representing Music Management for this 800 guest event will be the Hip Pocket Orchestra and the Remix Jazz Trio. Tickets are available at Aceticket.com. All proceeds from this event will benefit the good work of Cradles to Crayons. Learn about Cradles to Crayons HERE. For more information about the Platinum Plate Gala, click HERE. Go directly to the Hip Pocket Orchestra website HERE. For information about the Remix Jazz, click HERE. T.V. Diner host Billy Costa sat down with Stu Camiel and the Hip Pocket Orchestra to talk about the gala and the music. View the interview HERE. The Four Season’s Bristol Lounge remains one of the few rooms in the city where you can hear top notch pianists play 7 days a week – a great thing to keep this in mind if you are looking for live music in an elegant and relaxed setting. Music Management is pleased to have been partnering with the Four Seasons for many years to provide music in the Bristol Lounge, where you will find a great menu and never a cover charge to hear Boston’s best jazz musicians. Music Management recommends you pay a visit to The Bristol Lounge at the Four Seasons Hotel where we have updated the live music schedule to include lively jazz trios every Friday and Saturday night. On Fridays from 8pm to midnight The Bert Seager Trio, including Barry Smith on bass and Nat Mugavero on drums, is the featured group. The level of interaction and musical freedom that these musicians achieve while performing in a hotel lounge is refreshing. On Saturdays Joe Barbato performs with his trio during the same hours. If you are looking for a soulful jazz musician, Joe is the real thing. The Four Seasons has also hired Jeffrey Moore – Boston’s most elegant hotel pianist – to play Monday through Thursday nights from 6 to 10 pm and also on Sunday nights from 6 to 9 pm. Jeffrey has a vast repertoire and polished sound. After playing at the Langham Hotel for 27 years, he is really excited about stepping up to Boston’s finest hotel piano lounge. Known as “a living library of American Music,” Jeffrey literally has at his fingertips more than three thousand works of popular, classical, jazz, and show music. Every Sunday during brunch the fine jazz duo of bassist Dan Greenspan and pianist Doug Johnson perform from 11 am to 2 pm. Dan and Doug have been playing together for over 20 years and have a beautiful and intimate rapport.